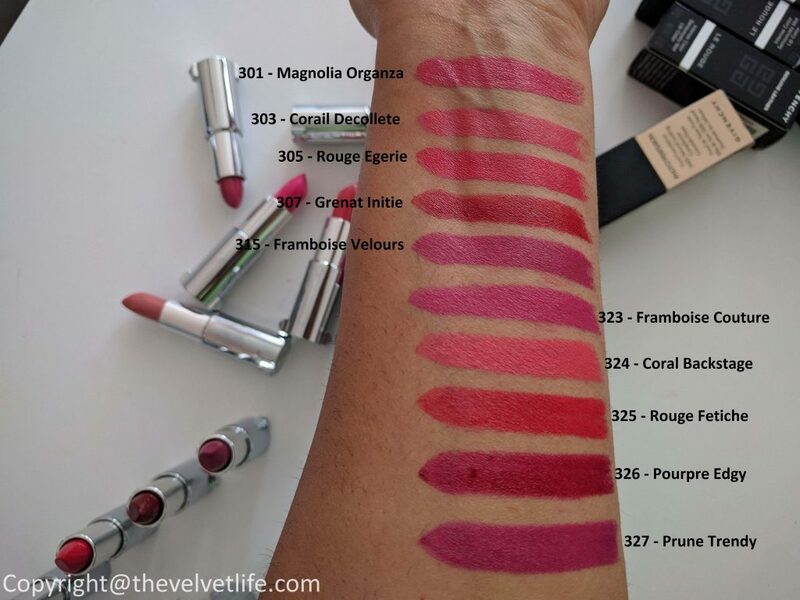 The Velvet Life - Page 70 of 130 - Musings of a Beauty Addict! 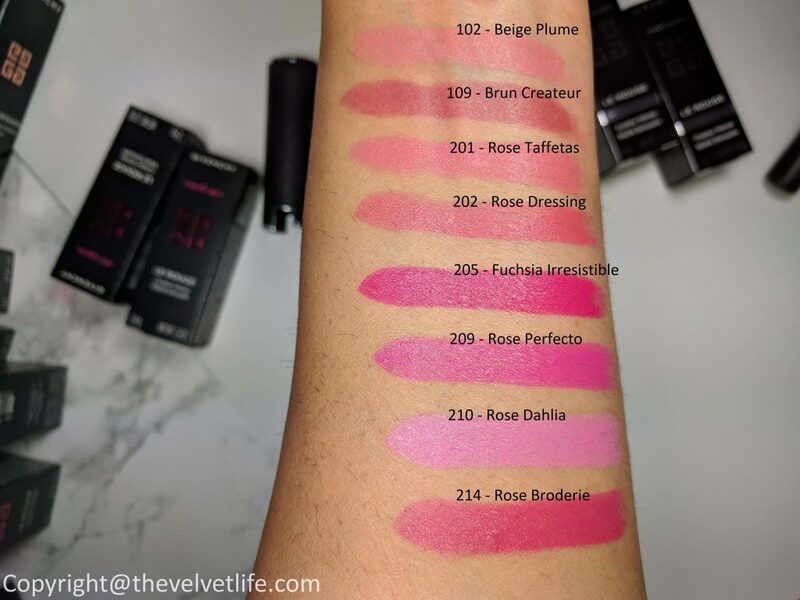 I hope you all had an amazing Christmas and New Year, this is my first post for 2018 and what could be more better than writing about one of my favorite and most go-to brand and formula for Lipstick. 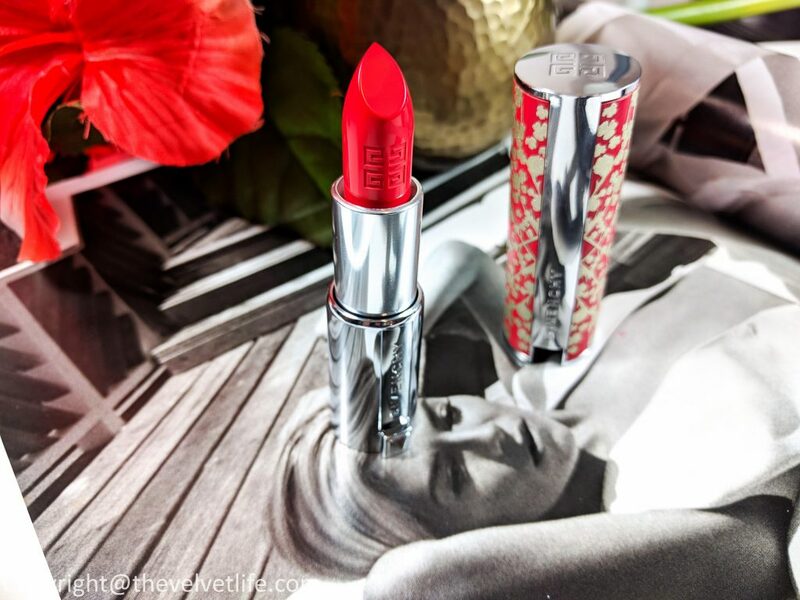 I am talking about Givenchy Le Rouge Lipstick. 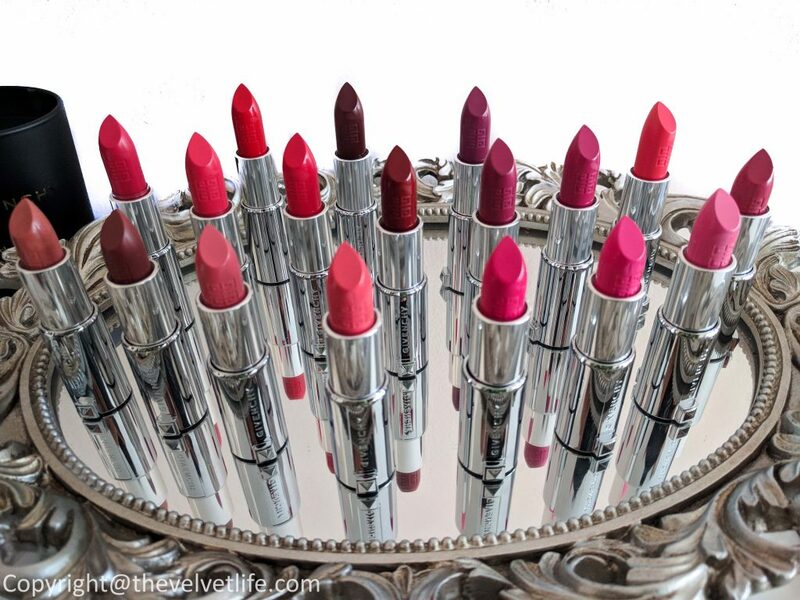 It all started with my first lipstick purchase from the brand and I never looked back, the lipsticks were always treasured and loved by me and my mother. 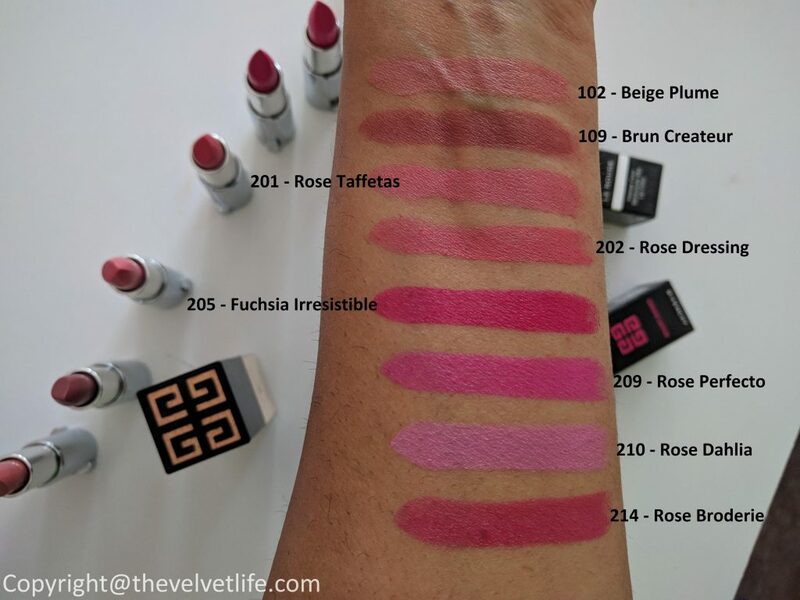 And now, I have got the chance to share my review and swatches of 18 shades of Givenchy Le Rouge Lipstick. If you have heard about them before, I am sure this would be on your wish list or you must have already bought it. And if you have not heard about them before, I assure you, you will fall in love. 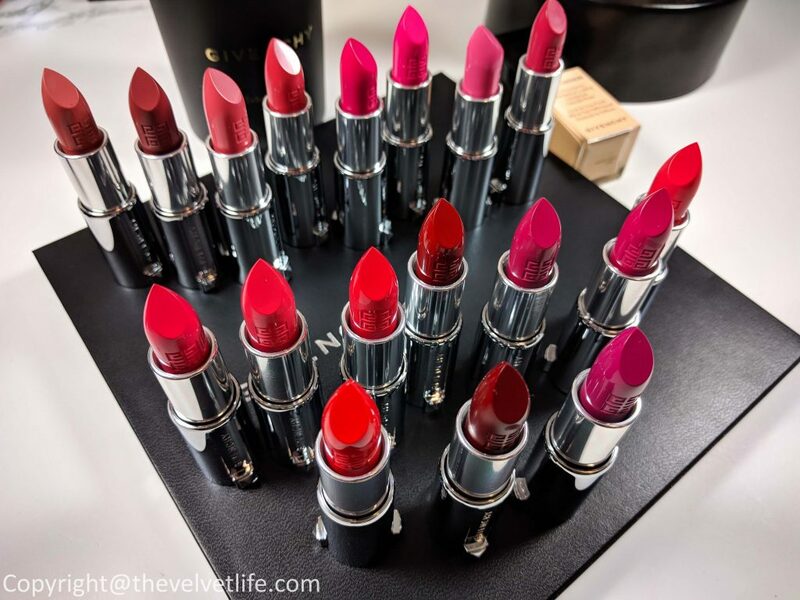 Givenchy Le Rouge Lipstick (CAD $42) is a semi-matte lipstick and is one of the most comfortable semi-matte formula I have tried. The lipstick is encased in an elegant silver and leather tube. 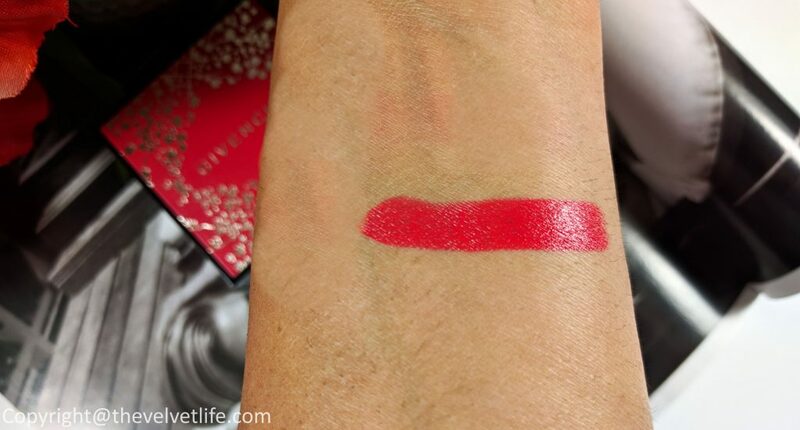 The texture of the lipstick is creamy and comfortable. 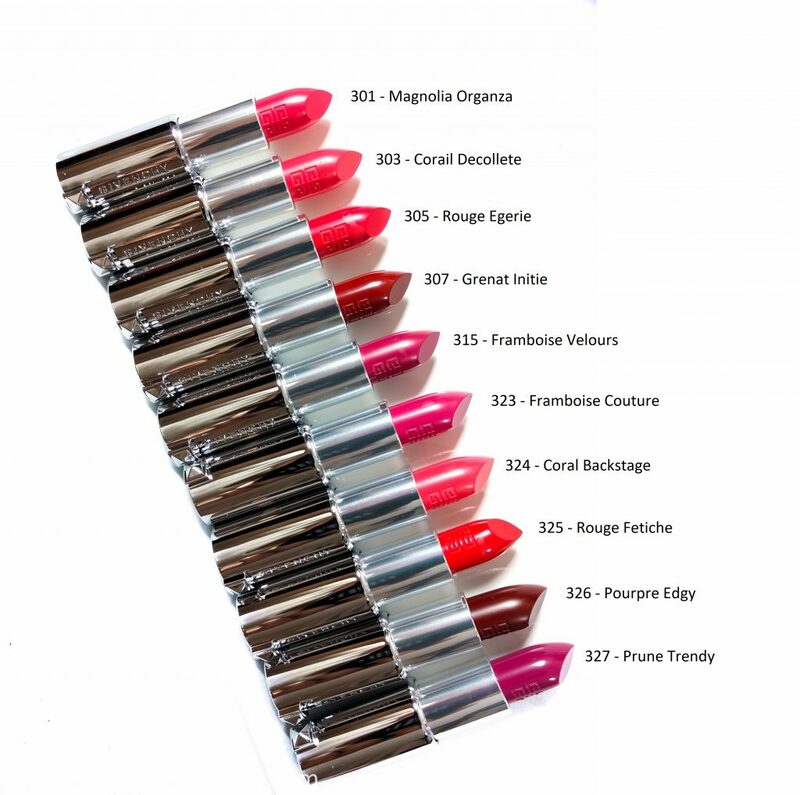 The formula is highly pigmented and one stroke on the lips gives a perfect amount pigment with radiant, lasting color. The lips do not dry out but the formula is very moisturizing and the staying power is amazing, almost 4-5 hours on me without eating much, but I don’t mind to apply and reapply. 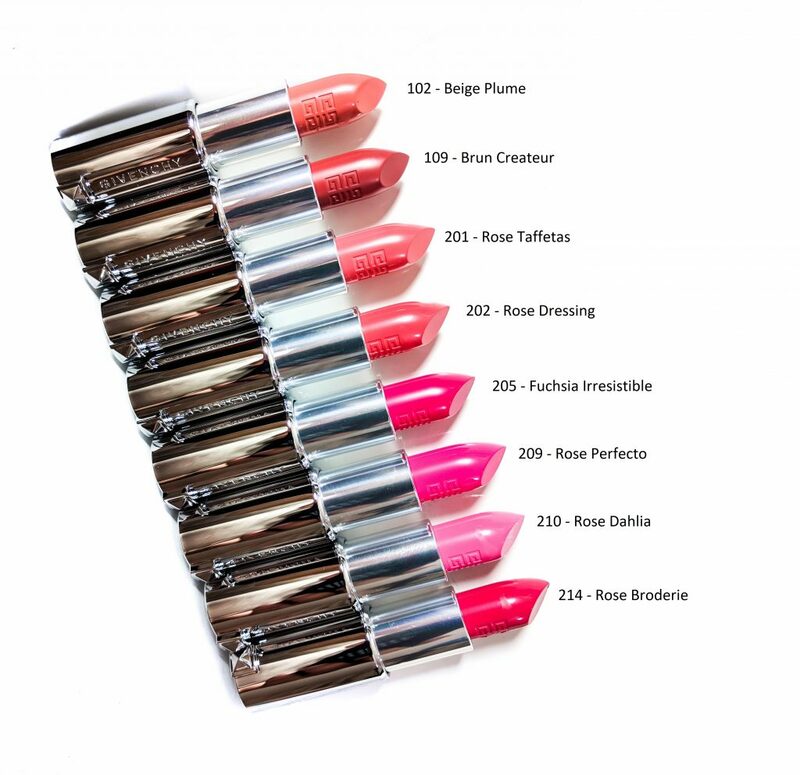 The formula glides on very easily on the lips, it is very lightweight and ultra-smooth. To apply it, it can either be applied straight from the bullet, after defining the lips with a lip liner or it can be used with the finger for longer staying power. I apply the lipstick with my finger to the lips and press them a bit. Then I apply the lipstick straight from the bullet to increase the intensity based on my need, this method does help the lipstick stay longer. This is a lipstick-as-accessory which looks great as well as works great. 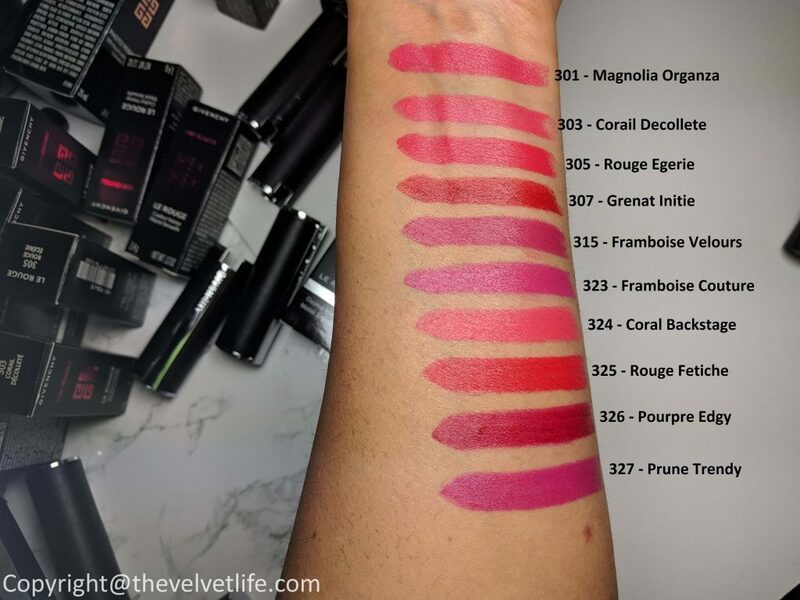 Overall, I highly recommend you to check this lipstick if you have not tried this and if you have already tried this, I hope the shades and swatches are helpful. Givenchy Le Rouge Lipstick is available in Sephora Canada, Sephora, and Net-A-Porter. 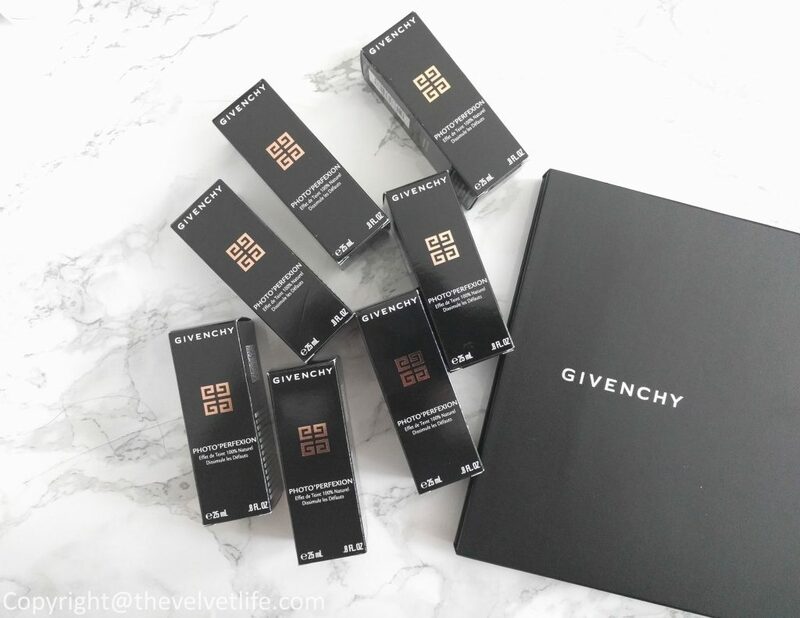 Giveaway for 10 of the best selling shades of Givenchy Le Rouge Lipstick + 2 universal lip liners + 1 beautiful Givenchy pouch (Value: $500+) to one of the lucky winners below, Canada Only, Good Luck! Note all entries are subject to verification. Givenchy is celebrating Chinese New Year with limited edition Givenchy Chinese New Year 2018 Collection. 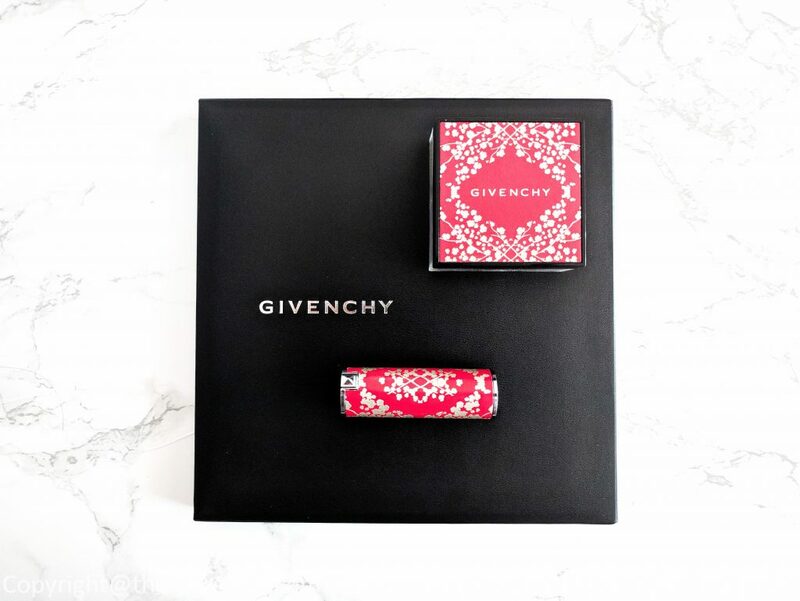 There are two products best selling in the limited edition packaging, Givenchy Prisme Libre Chinese New Year Loose Powder, and Givenchy Le Rouge Chinese New Year Lipstick. Givenchy Beauty’s Prisme Libre Chinese New Year celebrates the holiday with a limited-edition version of its loose powder in Mousseline Pastel. Jan 28 marks the end of the year of the monkey and the beginning of the year of the rooster. To celebrate this year’s sign, Givenchy has finished the outer packaging of Prisme Libre with a graphically styled feather-filled design in red and gold hues. 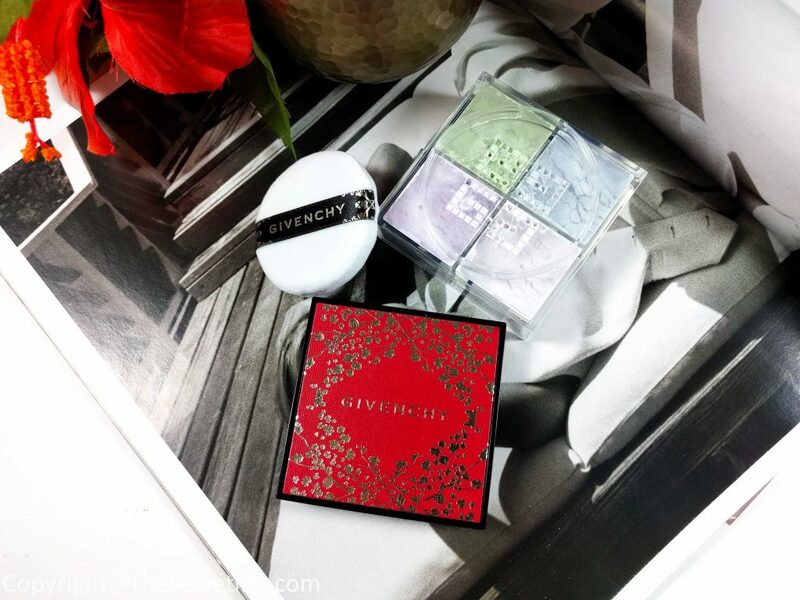 The vermillion red lid is highlighted with the Givenchy name in gold. The formula is same as the product in the permanent collection, very light, and the texture is ultra fine. It has four complementary powder shades which, when fused together on the application, enhance the complexion with a natural finish. It helps blur the imperfections and skin tone is evened out. The powder leaves a transparent, matte and radiant finish. Based on how much you use, it could be semi-matte which I prefer and get when I dust it lightly. The result is luminous, radiant skin. 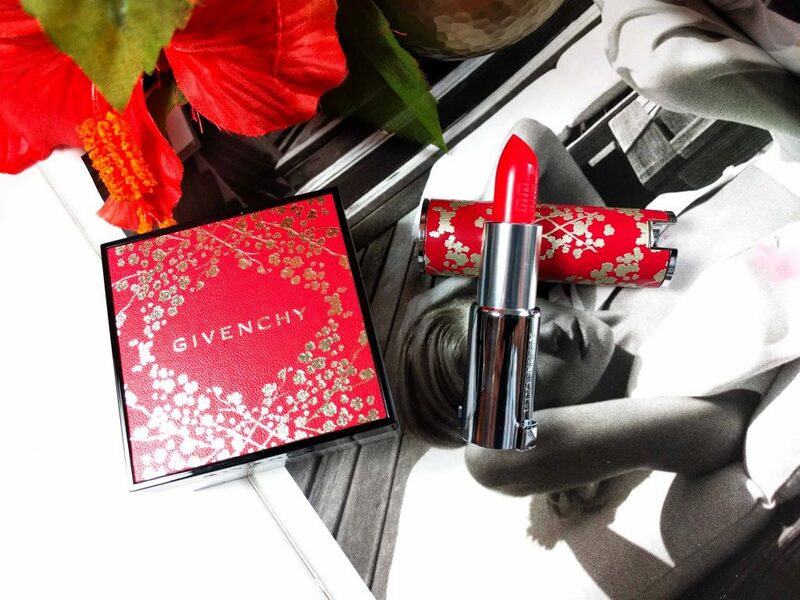 Givenchy Beauty’s Le Rouge Chinese New Year lipstick celebrates the holiday with a limited-edition version of its Le Rouge lipstick in the best-selling 305 Rouge Égérie shade which is a fierce red and perfect for that bold confident look anytime. This semi-matte lip color comes packaged in a tube featuring three strong symbols in Asian culture: red for China’s Spring Festival, gold representing prosperity, and cherry blossoms symbolizing beauty, strength, and renewal. The packaging compliments the Prisme Libre Chinese New Year Loose Powder packaging which is graphically styled feather-filled design in red and gold hues. 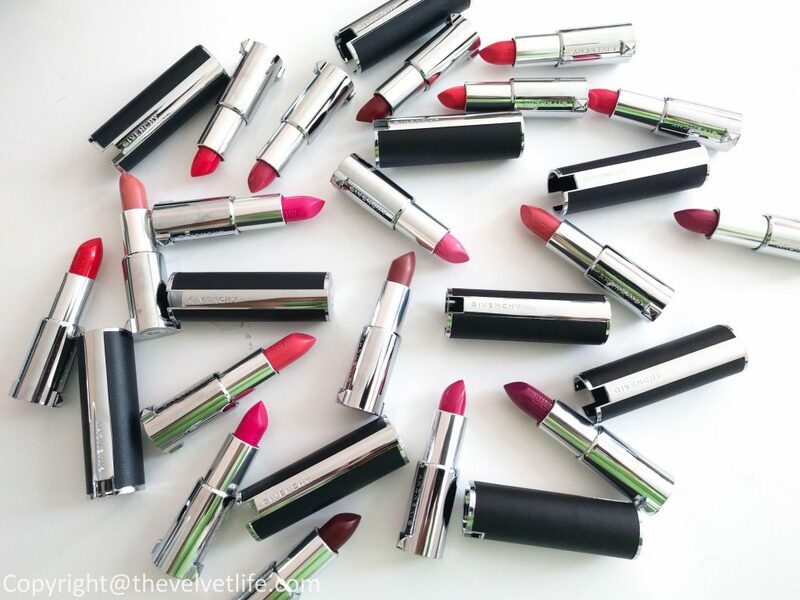 The formula is very comfortable to wear, as all the Givenchy Le Rouge lipsticks. It did not dry out my lips. The staying power of the lipstick is good and no feathering. Both the products look beautiful on the vanity as well as your bag. I have been loving them both along with Givenchy Photo’Perfexion fluid foundation which has become a favorite, check my review here. I would recommend you to check both the products if you are looking for a beautiful packaging as well as a beautiful product before they sell out as both are limited edition. 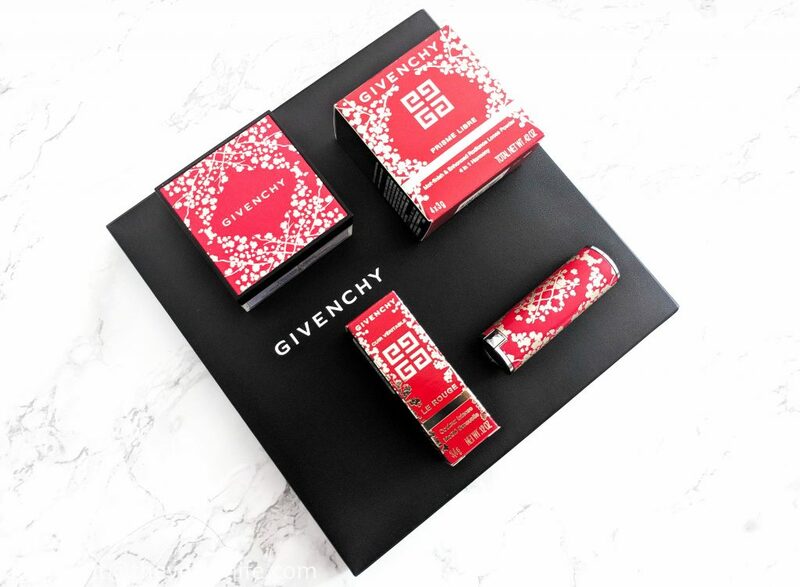 Givenchy Chinese New Year 2018 Collection will be available from January 2018 at Sephora and Sephora Canada. 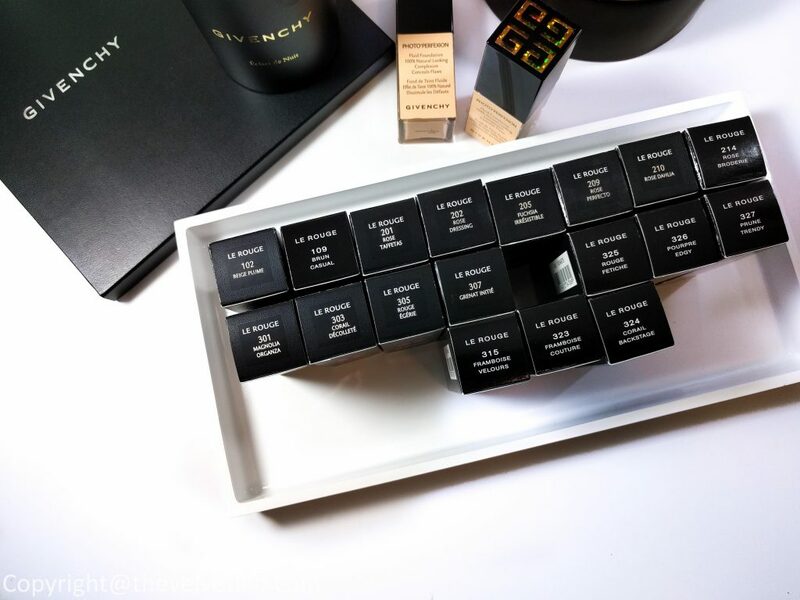 Givenchy is one of my favorite beauty brands, and I have mentioned it so many times in my blog posts and Yes, I am not going to stop saying that, ever. 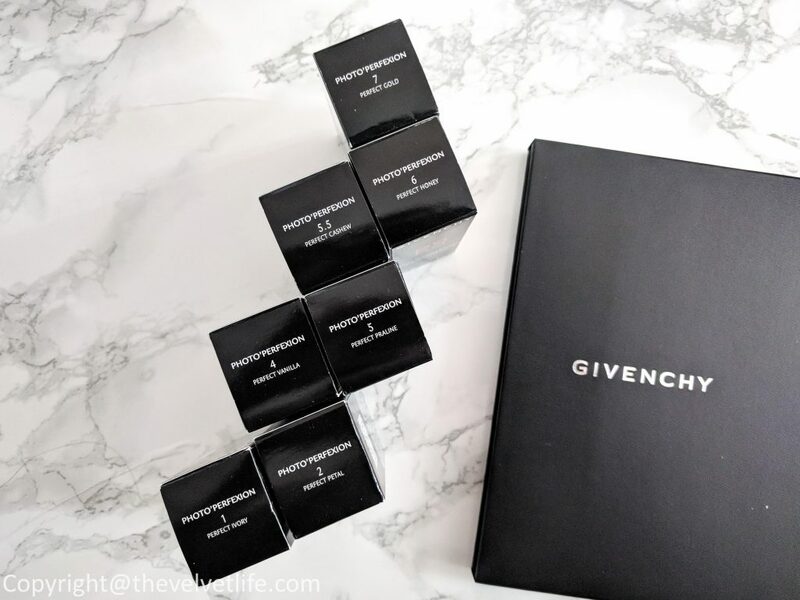 There is not a single product which I have used from Givenchy has ever disappointed me, this not only makes me happy but also raises the expectations bar from the products which are either new launches or which I have yet to try from the house. 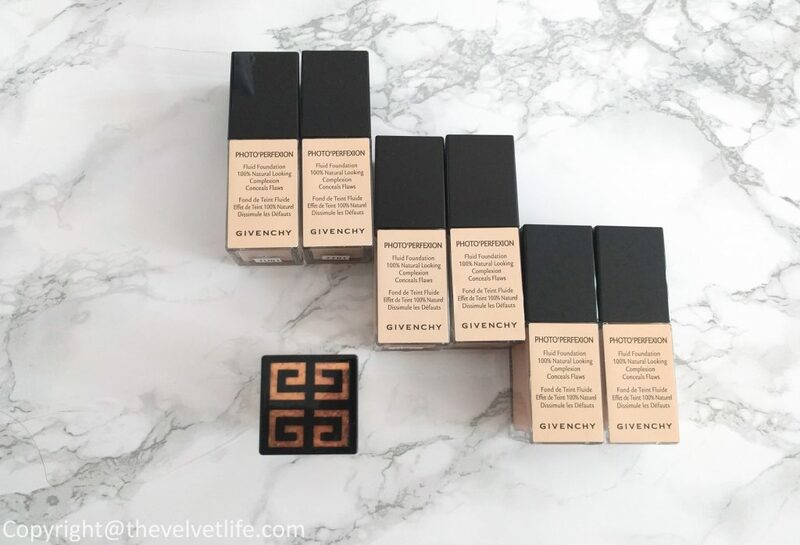 Givenchy Photo’Perfexion Fluid Foundation is not new but it is new to Canada. 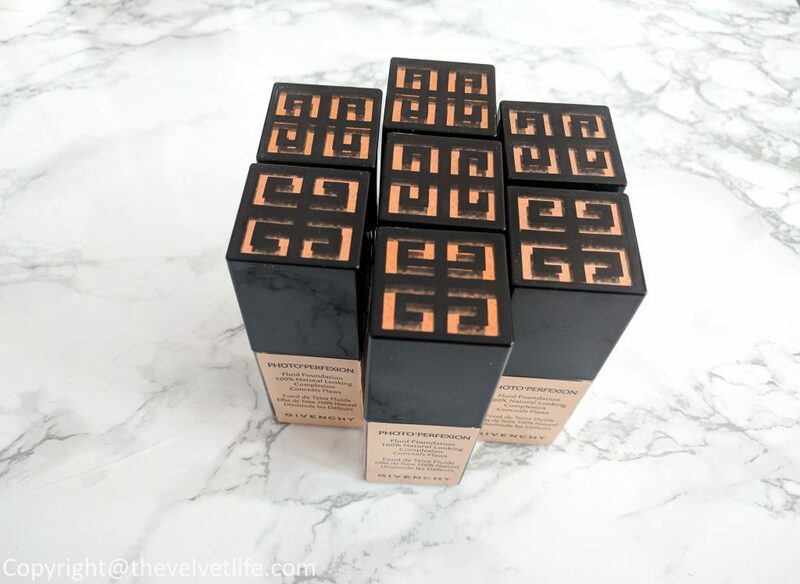 Givenchy Le Make-Up is bringing its three most popular foundations to Canada: Matissime Velvet, Photo’Perfexion, and Teint Couture Balm. 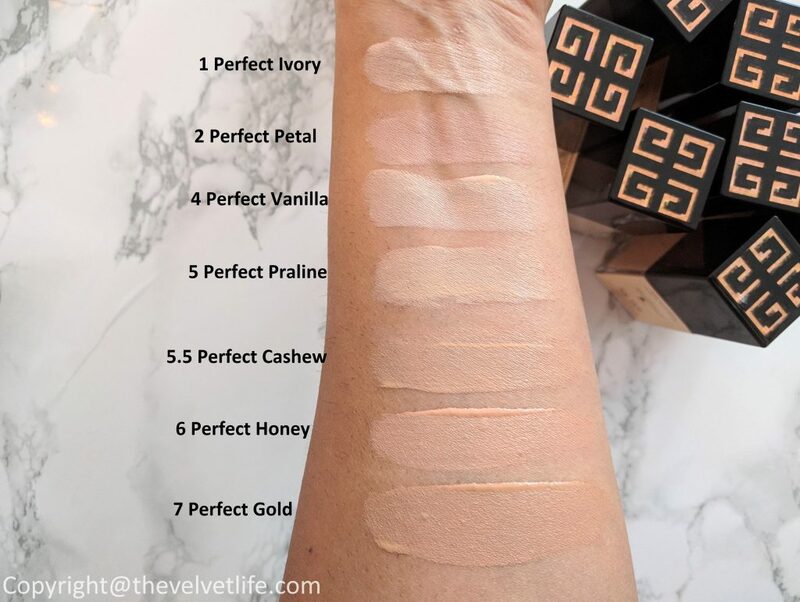 In this post, I am reviewing the Givenchy Photo’Perfexion Fluid Foundation along with the swatches of 7 of the total 12 shades available. 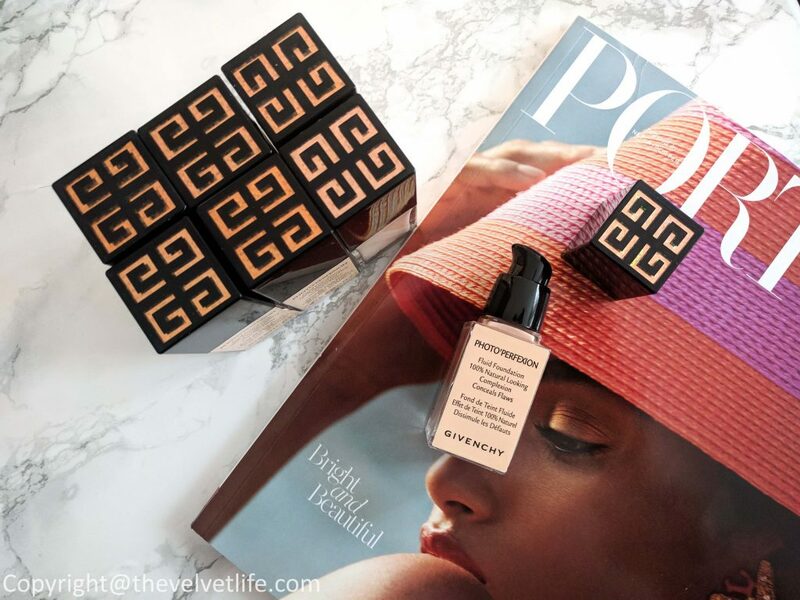 Givenchy Photo’Perfexion Fluid Foundation is inspired by digital imaging. It recreates the perfect skin quality obtained with digital touch-ups while remaining completely natural. 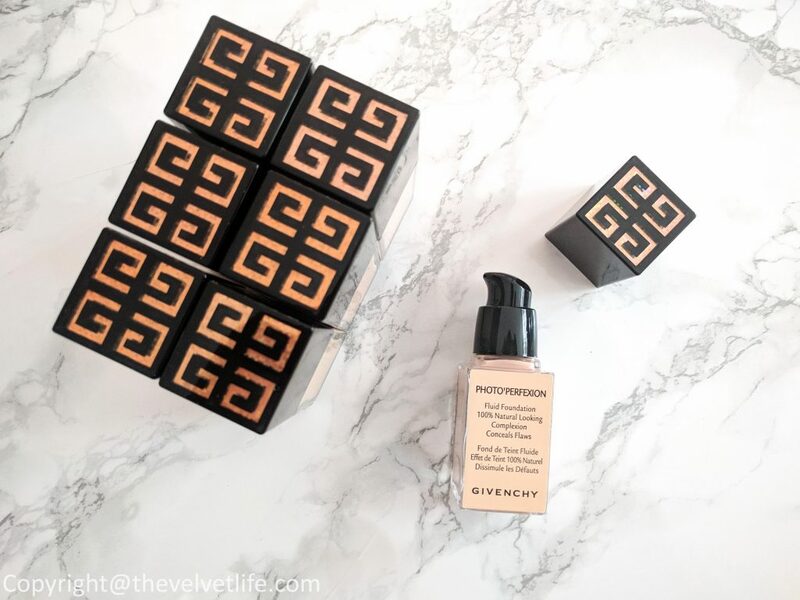 Givenchy’s exclusive, SkinPerfector Complex, acts like a digital eraser and Lighting Complex, adjusts the luminosity to the contours of the face to erase irregularities, imperfections, and fine lines. This foundation is available in 12 shades for all skin types. Givenchy Photo’Perfexion Fluid Foundation is a beautiful foundation with a creamy and smooth texture. The texture is not very runny and not very thick, just the perfect consistency to make the blending like a dream. The formula is great with some great technological as well as scientific advances to provide coverage with skincare benefits. This foundation is one of those which just makes you forget that you are wearing any foundation on your skin, it is very lightweight and just disappears into the skin. The coverage is very natural, light to medium. You may or may not need a concealer based on your needs. With age, I prefer more of a natural finish and I am not afraid of showing few of my spots or imperfections when I have them. This foundation did blur my problem areas, and the finish was very natural. The coverage is quite good, it made my skin look very healthy and radiant, making it even and smooth. The foundation is buildable from light to medium coverage. The longevity of the foundation is great, it stays on the whole day for about 8-10 hours on my skin with a primer and about 7-8 hours without primer without fading or creasing on my combination skin. It does not emphasize my dry areas and does not make my oily areas of the face oilier, the whole face looks radiant. As mentioned earlier, it is very light that it gives an impression to myself that I am not wearing any foundation, the other good thing is it does not breaks me out and does not emphasize my pores. The areas near the nose and jawline stay the way like it was just applied, and does not crease. My skin looks more even, natural, radiant, like a better version of my skin, who would not want that, right? It works well with or without powder over it for my combination skin type, the skin has that natural healthy glow without looking oily and with light to medium coverage. Overall, an amazing addition to my foundations and indeed a favorite. I highly recommend you to check this one out for the formula, texture, coverage, longevity, for that natural healthy glowy skin.